The Final Third First Campaign has come into existence because there are thousands of people in the UK who do not have a functional broadband connection at present (in “notspots” and because of technical issues with the existing telephone network), and approximately a third of the country whose future connectivity requirements will not be met by the market by 2017. 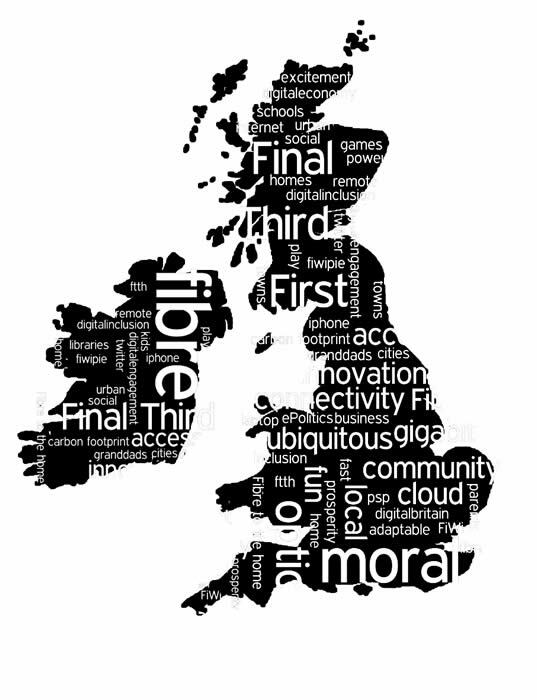 This 30+% of the UK who will not get a high speed connection capable of delivering next generation internet, as well as the many other services and applications that will be possible, is known as the “Final Third”, a term coined in the Digital Britain Report (PDF). The market includes commercial operators, such as BT, Virgin, Vtesse, H20, as well as municipal players who are using public funds to create regional projects which will deliver Next Generation Access through public-private initiatives. At present, these commercial players cannot find a business case for connecting the Final Third, with the most common arguments being that where fibre needs to be laid in rural areas, where the number of potential connections are less than in urban areas, the economics do not stack up for this to be profitable for the telcos. However, there is considerable evidence from other countries that it is possible to make such a business case, particularly where the communities get involved. It is also well-known what the social and economic impacts of future-proofed connections are, and how important it is that every citizen and business has access to affordable, universal broadband. As we move towards a much more ‘online world’, the need for everyone to have access to future-proofed connectivity increases by the day. Help us to create the necessary resources for a nationwide, cohesive resolution to solve this problem. Working together and collaboration is key.